Artist and Illustrator, John Harmer, studied Fine Art at Worthing Art College between 1987-1989, and then at Bournemouth and Poole College of Art and Design from 1990-1993. He now lives and works in West Sussex. His work is largely concerned with the formal elements of his chosen medium, honing in on form, colour and texture. The latter of which, he takes particular joy in experimenting with; areas of impasto stand out in visible relief beside watery washes, while others have been scratched and scraped away creating textural ridges, and exposing numerous layers beneath. 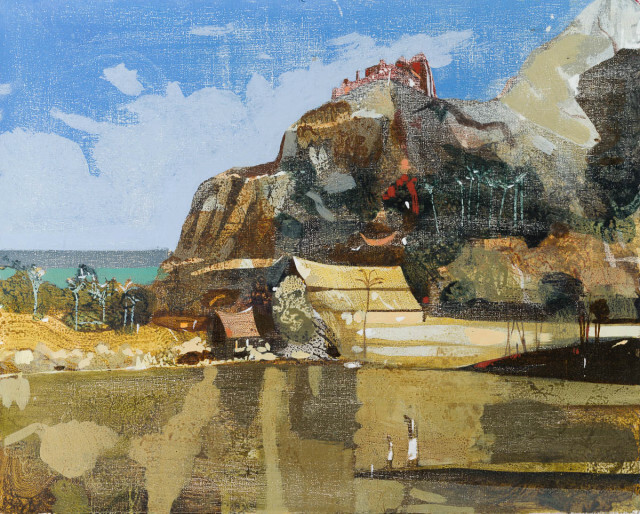 Harmer explains that typically the impetus and inspiration for his work lies in the many depictions of landscape and architecture in art, cinema and television. However, his latest body of work has begun to reflect his interest in British landscape painters; Nash, Ravilious, Hitchens and Piper. These found images often establish a starting point for a piece. However, as Harmer points out “paint is a responsive medium and the completed painting may deviate considerably from the original source, occasionally tending toward abstraction”. He says, “for me, an open-ended and free approach is what makes painting such an exciting and compelling creative project”.